BBB Architects, a world-renowned architectural firm based in Toronto, has been chosen to manage the design and construction of the Gene Polisseni Center, future home of the NCAA Division I men’s and women’s hockey programs at Rochester Institute of Technology. BBB Architects was selected from four firms that were identified as finalists for the project, according to James Watters, RIT senior vice president for finance and administration. BBB’s specialties include sports and entertainment venues, serving as architects for the Air Canada Centre in Toronto, General Motors Place in Vancouver, and the current redesign of Madison Square Garden in New York City. 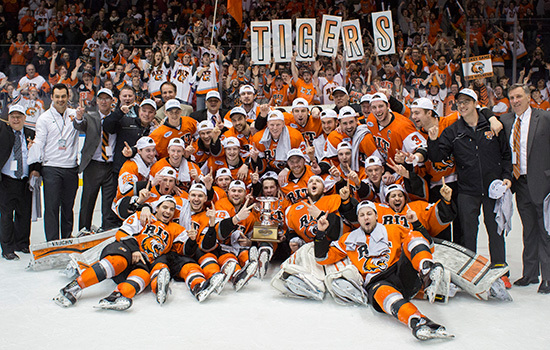 RIT is in the midst of Tiger Power Play—The Campaign for RIT Hockey. The fundraising effort is in support of a new arena and is currently more than halfway to its $15 million goal. A $4.5 million partnership between the Polisseni Foundation and RIT trustee B. Thomas Golisano, founder and chairman of Paychex Inc., resulted in the naming of the forthcoming facility as the Gene Polisseni Center. Construction is expected to cost between $30 million and $35 million. RIT is developing a business plan for the facility’s operation intended to cover the remaining expenses. A location on campus for the Gene Polisseni Center and a timeframe for the start of construction have not yet been finalized. For more information on the Tiger Power Play campaign, go to rit.edu/powerplay.